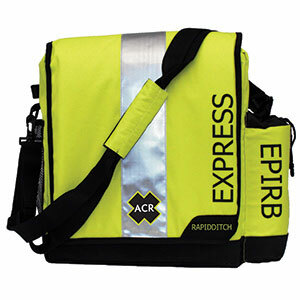 Ditch bags like this one by ACR are specifically designed for abandon ship situations. Boats seldom sink. But when they do—either due to a collision, fire or some other calamity, events can “go south” quickly. Take for example what happened to Steven Callahan, who collided with what he thinks was a whale while on a single-handed passage from the Canaries to the West Indies. As Steve states, “The water came thundering in like a river.” Before Steve’s boat sank, he was able to grab his ditch bag—which contained a number of items instrumental to his survival. What is a ditch bag? A ditch bag, also called an abandon ship bag, contains key items needed to summon help and to survive in a life raft while waiting for rescue to arrive. A ditch bag must be kept in an accessible location onboard, ready for immediate removal should the need arise. Who needs a ditch bag? For the occupants of a life raft, having an EPIRB can spell the difference between an extended test of survival and a relatively short period of discomfort. Positive flotation: Since the bag may land in the water before you get it into the raft, your loaded ditch bag must float. Look for foam buoyancy panels sewn into the bag. When flooded, a buoyant ditch bag loaded with gear should not sink. Water-resistance: Ditch bags do not necessarily need to be waterproof, but water should not easily enter the bag. Non-waterproof items within the bag can be placed in waterproof dry bags, which will also enhance the buoyancy of the bag. Visibility: Make sure the bag is an easy-to-see color, like bright yellow or orange. For visibility at night, some ditch bags include reflective tape. Where lacking, reflective tape can be purchased separately and sewn onto the bag. SOLAS-grade flares are preferred because they can be seen for the greatest distance. Inner pockets and dividers: Rescue and survival items must be organized and easy to see. Look for pockets and/or dividers to separate flares, medical items, food, water and other gear. Some bags include interior lanyards to keep key gear from floating away. Carry straps and tethers: Every ditch bag should include a tether with a clip that enables you to secure the bag to yourself (if you must swim to the raft) or to the raft itself before you get in. Adequate size: The bag must be large enough to contain survival gear plus food and water for you and your crew. Your ditch bag should include several ways to summon help (rescue) and in addition, include items you will need to survive until rescue arrives. To ensure a timely rescue, your ditch bag must include an EPIRB (preferred) or a PLB. Next in importance are radio communications followed by visual and sound signaling devices. For an informative West Advisor on how to select visual distress signals, click here. The importance of having an EPIRB or a PLB cannot be overemphasized, since these devices can turn a protracted test of survival into a relatively short period of discomfort. Katadyn’s Survivor 06 Reverse Osmosis Watermaker produces up to six gallons of water per day—enough to hydrate up to 24 people indefinitely! Visual signals include a selection of flares, and other signaling devices, such as a rescue mirror, dye markers, emergency signal lights and strobes. SOLAS-grade flares are preferred; since they can be seen for the greatest distance. A waterproof handheld VHF radio and a handheld GPS with extra batteries are also a must, since you can use these items together to know your position and transmit it to nearby marine traffic or shore-based help within VHF range. The food, water and survival gear in your ditch bag should supplement the gear in your life raft’s equipment pack. Equipment packs, due to volume constraints and to keep the cost down only include a minimal amount of gear. In a life raft, or anywhere else for that matter, staying hydrated is of utmost importance. For coastal cruising, where the time to rescue will most likely be short, you can supplement your life raft’s supply of freshwater with emergency water rations, available in 125ml pouches that store flat. 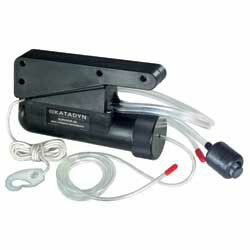 But for offshore cruising, a hand-operated reverse osmosis watermaker, such as Katadyn’s Survivor 06, is highly recommended. When augmenting your life raft’s equipment pack, consider how long rescue might take. How far offshore will you be? Will there be other boats (or ships) along your route within VHF range? Provided that you have an EPIRB or a PLB, the reality is that unless you are way off the beaten track, the time to rescue is normally short. Your ditch bag should be kept in an easy to access location, preferably next to the companionway of your boat. Drill the crew on the ditch bag’s location and importance. In the end, ditch bags are like an insurance policy that we hope to never use. Nobody plans on running into a shipping container or counts on a rogue wave sinking their boat. Sure, putting a ditch bag together requires some time and expense. But if you ever get stuck in a life raft, you will be glad you did. Don’t forget to check the “Video Resources” at the bottom of this article for an overview of ACR and UST ditch bags—plus an informative interview with John and Amanda Neil (recognized offshore sailing authorities) about key gear they include in their ditch bag. Below are seven “short lists” to which you can refer as you assort your gear. For an overview of the features and benefits of ACR and UST ditch bags, click on your choice of the viewers below. The first video (top) covers ACR ditch bags. The second video (middle) covers UST ditch bags. For an interesting video in which two experienced cruisers (John and Amanda Neil) discuss the gear that they include in their ditch bag, click on the viewer at the bottom.